I spent hours wracking my brain trying to figure out how to make this comic work with Score somehow, having him scare off the kids who’re trying to trick-or-treat him. It finally dawned on me that I was using the wrong black duck. Ah, well. I’m not always a genius, I’m afraid. Where on earth did you find the crazy Halloween ducklings??? That’s how my flock grew to such mammoth proportions, yep. Nearing 400 members, and I might have purchased 100 of them. All the rest have been gifts. 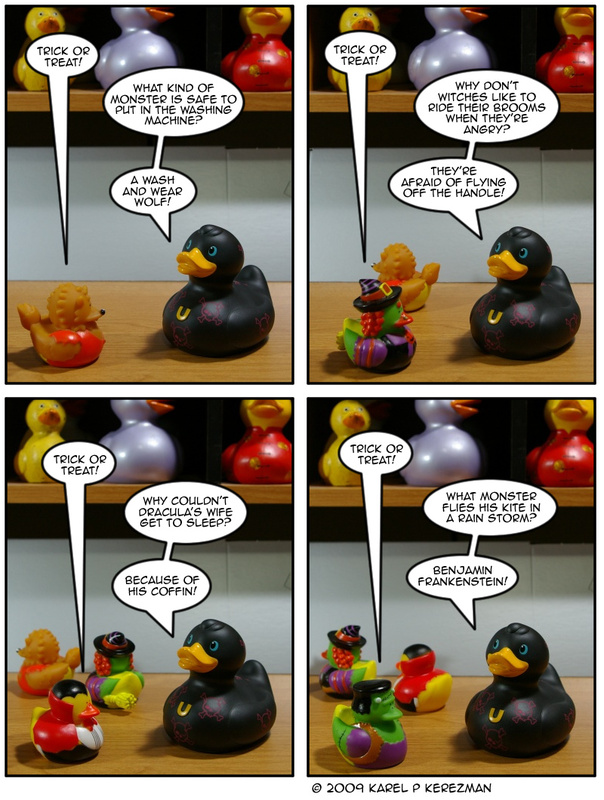 Oddly, I have none of the ducks that appear in today’s comic. OMG! I laughed my head off.